I'm not sure if there is a good way to do this using Jotform. I'm testing a business idea by driving adwords traffic to an unbounce landing page. In order to do conversion tracking, I need to place a code snippet into a thank you page. There is no other website for this service yet. So the thank you page would need to be a jot form page. Is there any way for me to do this using jot forms? By code snippet do you mean html code? 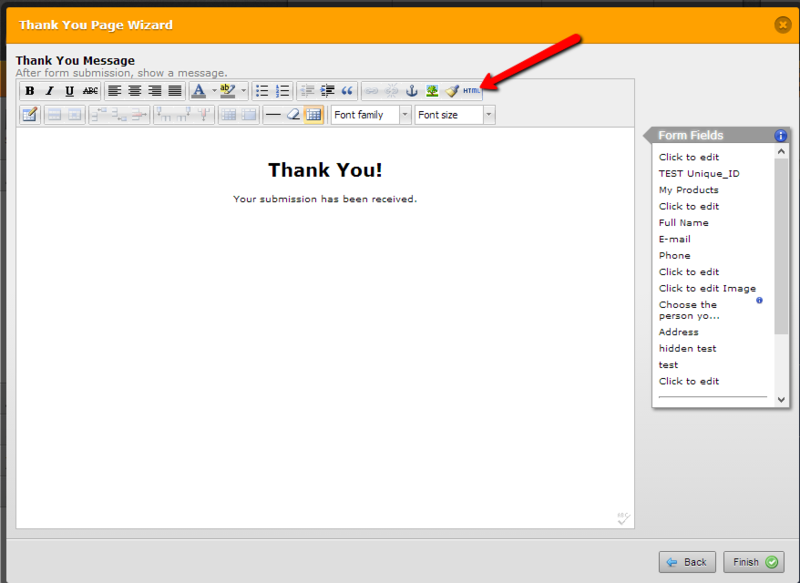 If yes, with JotForm you have the option to customize your thank you message, by entering the information that you would like into the html editor while on the Thank You Page Wizard. You can switch to the source code in the editor to add your content. For more information on the Thank You page please review this guide. I hope this helps! Please let us know if this is not the solution that you are looking for by letting us know the type of code snippet that you would like to add.